Read Write Inc(RWI) is a consistent, rigorous and dynamic literacy programme which teaches EVERY child following it to read as early in their school careers as possible. 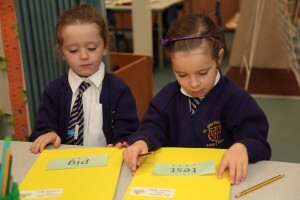 Using synthetic phonics, children learn to quickly blend letter sounds together by following a fun and effective programme. The aim is to get children through the programme quickly ensuring that they become fluent and confident readers. Why have we switched to RWI? The RWI has been proven to be a very successful method in other schools throughout the country. Since we are passionate about reading at St John Fisher, we endeavour to help our children become the best readers that they can as early as possible and so the scheme suits our needs and the needs of our children perfectly. All the children from Reception to Year 3 have been assessed by our RWI Lead (Miss Morgan) and have been placed in groups at the appropriate level for them. Children will be assessed at the end of each half term and placed into new groups if this is necessary. This is to ensure that all children are working at the level which suits their personal needs. Children will read their RWI books every morning with a fully trained member of staff. This could be a class teacher (not necessarily their own! ), or a teaching assistant. These books are kept in school. Your child will still bring home a reading book and it is still extremely important that you listen to your child read every day.